Providing your horses with the proper protection from the weather is of the utmost importance when you’re a horse owner. Your horses should have somewhere to go when they need to get out of the sun, rain, wind, or cold. 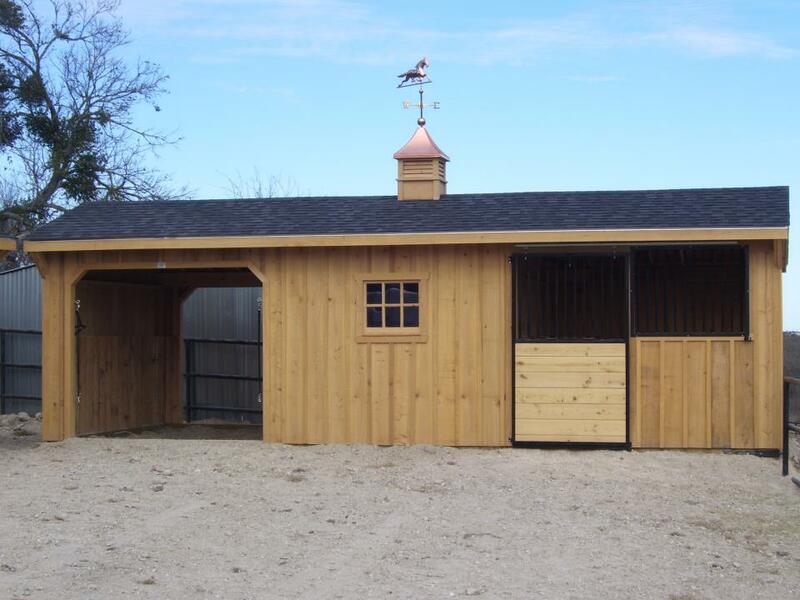 Outside of offering three standard run-in shed sizes, Deer Creek Structures offers you a custom horse shed if you’d like. 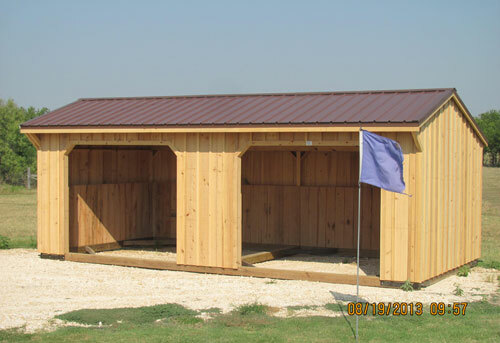 Regardless, the run-in sheds from Deer Creek Structures are a necessity for all the horse owners in Oklahoma. Give Deer Creek Structures a call at 254-546-2276 today to see which one would be best for your property. The 8-foot, 10-foot, and 12-foot portable run-in sheds from Deer Creek Structures will set your horses up with a place to stay when the weather is bad. The run-in sheds have durable cypress siding on them and made from materials that stand up to the local Oklahoma climate. If you only have one horse, you don’t need a huge run-in shed to protect it. An 8-foot horse shed from Deer Creek Structures will be more than enough to house your prized horse. 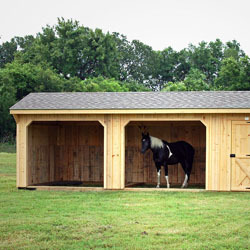 The horse will be able to walk into and out of its run-in shed without a problem. You’ll also be able to move portable run-in sheds from Deer Creek Structures around if you ever find your shed would work better in a different location on your property. 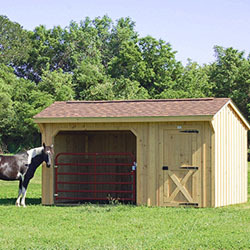 If you need something slightly larger than an 8-foot run-in shed, a 10-foot horse shed from Deer Creek Structures might be better for you. It’s a great solution for those who have multiple horses on their property running around at any given time. 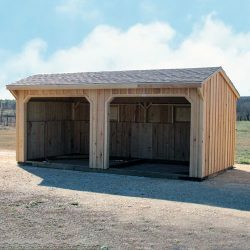 You can fit a few horses in one of these portable run-in sheds at once and not have to worry about them crowding one another. If you have a hoard of horses roaming around on your land in Oklahoma, a small run-in shed just isn’t going to cut it. 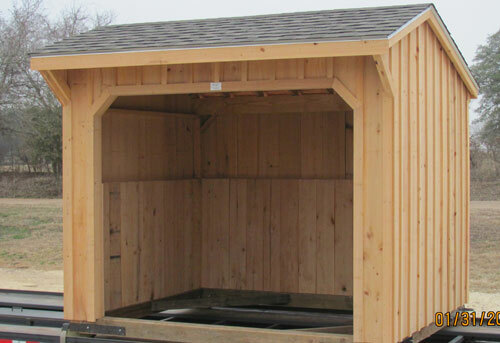 Instead, consider going with one of the 12-foot run-in sheds from Deer Creek Structures. They have all the room you and your horses could ever want. They’ll provide them with cover and keep them comfortable and safe, so you don’t have to worry about them sitting in the sun all day or getting stuck in the rain. See What Size Run In Sheds are on the Lot!